Those of you that kindly follow my YouTube channel will already know this, but for everyone else, I've had a bit of a revelation this week. On Friday afternoon at work, I felt in need of a hot drink. 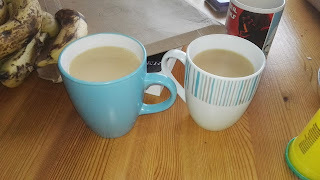 Now, long time readers may remember the tea vs coffee debate between my blog and Life, Explained, so of course my choice of drink has to be tea (although I do quite like coffee). I happen to have 2 mugs on my desk at the moment, my regular mug (a present from my son from last Fathers Day) and another mug which I generally use for visitors. And a somewhat crazy thought crossed my mind. What if... I made TWO cups of tea??? I finished one cup of tea, and guess what? There was a second cup, right there, ready for me. Perfection. I can only theorise that this may work for other drinks, like two cups of coffee. Do experiment and let me know. That is genius, Mike but I have to ask,did your tea get cold? That seems to happen with coffee. When I had my cup warmer, that used to do quite nicely. Thanks so much for the blog link, I appreciate it. Because of your terrific post, views, comments high! I work outside quite a lot and during these colder months I carry a small flask of hot tea, there's nothing finer than tea on demand. It's like when I visit my mother in law - tea is served pretty much as soon as the cup is empty.